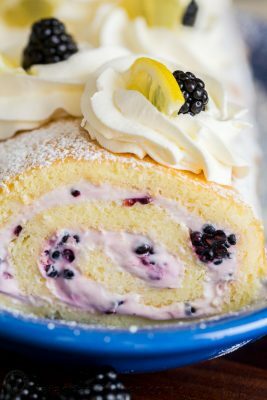 Fluffy and moist Blackberry Lemon Cake Roll (Swiss Roll) that's easier than you think! Impress everyone with this show-stopping Blackberry Lemon Cake Roll. Whisk together flour and baking powder and sift into egg batter one third at a time, folding to incorporate between each addition and scraping from the bottom to catch hidden flour pockets. Stop mixing when you no longer see streaks of flour. Transfer to lined baking sheet and bake right away at 350˚F for 13-15 min (mine took 15 min) or until top is golden. Remove from oven and right away run a thin edged spatula or knife around edges of your cake to loosen from the pan. While cake is hot***, invert cake face down onto a clean, dry linen towel, remove parchment paper then roll cake into the towel. Let cool to room temp (30 min - 1hr) in a draft free room. In a large mixing bowl, combine 8 oz softened cream cheese, 8 Tbsp softened butter and 1 cup powdered sugar. Beat together starting on low speed to incorporate sugar, then turn the mixer up to high speed for 2-3 min or until whipped, white and fluffy, scraping down the bowl as needed. Add coarsely chopped blackberries and stir into cream with mixer on low, just until incorporated. **Sponge cakes rely on the volume of the whipped eggs to rise properly. It is extremely important to beat the eggs and sugar for the time stated. ***To prevent cracks in cake roll, it should be rolled in the linen towel right after it comes out of the oven.